Saints scored nine tries as they roared back to beat Newcastle Falcons 59-33 and set up a home final against Saracens in the Premiership Rugby Cup. 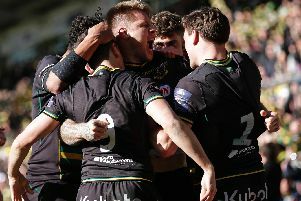 Rory Hutchinson was the architect of the win, delivering a sublime centre showing, as Saints stepped up after a shocking start at Franklin's Gardens. The black, green and gold had gone 21-0 and 28-7 behind, but they bounced back in devastating fashion as they flayed the Falcons with some slick attacking rugby. A double from Heinrich Brüssow plus efforts from George Furbank, Ahsee Tuala, Lewis Ludlam, Jamie Gibson, James Fish, Taqele Naiyaravoro and Luther Burrell got the job done. It means Saints have now scored an incredible 39 tries in their past four matches as they continue to stay alive on three fronts. They will be desperate to claim one more win in the Premiership Rugby Cup, with Saracens coming to the Gardens for the showpiece on March 17. But it looked like that encounter would elude Saints when the Falcons made a flying start on Saturday afternoon. Vereniki Goneva and Zach Kibirige combined down the right to open the door for scrum-half Sonatane Takulua to start the scoring. Brett Connon converted and Newcastle were 7-0 up inside just two minutes. Saints were then dealt a big blow as skipper Teimana Harrison was forced off due to a tight hamstring, with Tom Wood his replacement. Newcastle were swarming all over their hosts, frantically searching for a second try as they continued to crank up the heat. And it wasn't long before another try came as Josh Matavesi found himself one on one with Ehren Painter and skipped round the despairing dive of the prop to score. Connon kicked and Saints were 14-0 down, having failed to land a single blow on the Falcons during the opening 10 minutes. It was turning into a black,green and gold horror show and after Goneva beat James Grayson and ran in to score, sluggish Saints were really struggling. Connon converted again to make it 21-0 after 19 minutes and the sparsely-populated Gardens groaned as one as hopes of making the final really started to ebb away. Saints did finally get some possession, roared on by the crowd, but Newcastle stood tall to win a penalty on the edge of their own 22 and stop the surge. Grayson then had to do some good defensive work at the other end to stop Falcons scoring their fourth. And that kickstarted Saints as Hutchinson produced a moment of magic, beating the Falcons defence and picking the perfect time to pass to Furbank for the score. Grayson converted, but the Falcons hit back almost immediately as Goneva produced a lovely grubber kick and Kibirige latched on to the bouncing ball to dot down. Connon converted superbly from the right and the hope that had found its way back into the Gardens following Furbank's score started to head out of the exits again. However, Saints refused to go away and they grabbed a vital score before the break as some lovely play by flanker Gibson on the right wing allowed Tuala to dot down. It was the Samoan's first score of the season and it wasn't to be Saints' last before the break as a fantastic move, again started by Hutchinson, resulted in Wood offloading to the onrushing Ludlam to score. Grayson converted again and the gap was now just seven points with Newcastle starting to lose their security. And they were close to losing their lead after Saints emerged for the second half with real determination, shoving Gibson over the line for the score. Grayson had the chance to level the scores with the conversion, but he didn't get a clean contact and missed. However, it wasn't long before Saints led for the first time as Wood and Ludlam gained vital ground near halfway and the ball was moved quickly with Gibson setting up Fish for the score. Grayson converted to make it 33-28 to Saints, and the Falcons were struggling to live with the speed of the home side. But Newcastle were still a threat at the other end and after Goneva was denied by the TMO, Chris Harris bounced off a couple of tackles to level the scores. Connon missed the kick for the first time and Saints then introduced a whole new front row, with Alex Waller on for his 250th Northampton appearance. And after Wood made a big forward run, the ball was moved left for Naiyaravoro to turn on the power, beating a couple of defenders to score. Grayson converted, in off the right upright, and Saints led 40-33 in a crazy game that still had 23 minutes remaining. Newcastle were really struggling to contain their opponents and after Grayson kicked to the corner, a big lineout drive allowed replacement flanker Brüssow to bag a score. Grayson converted, bringing roars from the home fans who were now really sensing their side were on their way to the showpiece with a 14-point lead now in place. And Saracens were really in sight when Saints produced another stunning effort, which started deep inside their own 22. Hutchinson again had the key to the Newcastle door and after some great offloads by Wood and Grayson, Burrell provided the finishing touches. Grayson again converted to make it 54-33 and there was still time for another Brüssow score as Saints sealed their place in the final in some style. Saints: Furbank; Tuala (Collins 70), Hutchinson, Burrell, Naiyaravoro; Grayson, Reinach (Mitchell 50); van Wyk (Waller 53), Fish (Marshall 53), Painter (Hill 53); Ribbans (Moon 70), Ratuniyarawa; Gibson (Brüssow 61), Ludlam, Harrison (c) (Wood 8). Newcastle Falcons: Arscott (Sinoti 54); Kibirige, Dunbar, Matavesi (Harris 38), Goneva; Connon, Takulua (Stuart 67); Davison (Brocklebank 25), Socino (Cooper 48), Wilson (Mulipola 57); Green, Davidson (Cavubati 57); Welch (captain), Chick, Nagusa (Uzokwe 48).